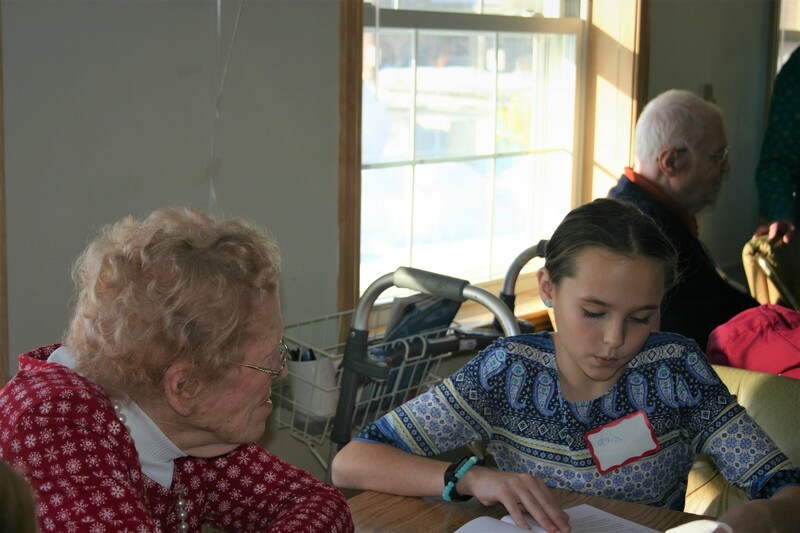 When Kimberly Wright, a fourth grade teacher at Mapleton Elementary School, attended a book release party for “A Gift to the Future from the Leisure Village Writers” in spring 2017, she became inspired to connect her students to the group of writers from the retirement facility. PRESQUE ISLE, Maine — When Kimberly Wright, a fourth grade teacher at Mapleton Elementary School, attended a book release party for “A Gift to the Future from the Leisure Village Writers” in spring 2017, she became inspired to connect her students to the group of writers from the retirement facility. One year later, Wright’s students are the proud authors of their own book, “A Gift From the Future to the Leisure Village Writers.” Wright, her students and their families and the residents of the retirement center whom the students interviewed attended a special book release party at Leisure Village on Sunday, Jan. 21. 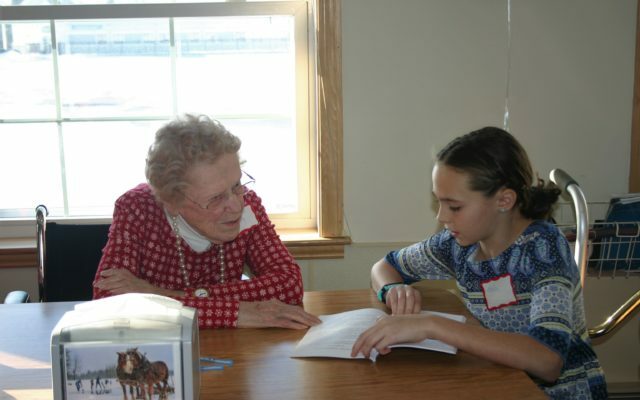 Eleven-year-old Olivia Locke reads to Leisure Village resident Marjorie Bishop the story that Locke wrote about Bishop for the book “A Gift From the Future to the Leisure Village Writers.” Both Locke and her classmate JoLea Robinson, 10, interviewed Bishop in March 2017 when both girls were fourth graders in Kimberly Wright’s Mapleton classroom. 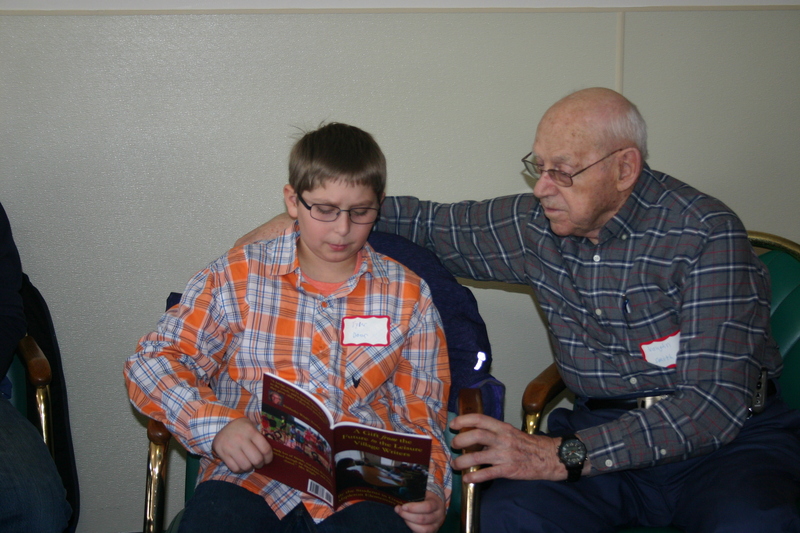 Their fellow classmates joined the Leisure Village residents for a book release party at the Presque Isle retirement village on Sunday, Jan. 21. The retirees had shared their life’s memories with former teacher Martie Pritchard of Chapman who compiled the personal stories into an anthology. At the release party the students, who are now in fifth grade, read their finished stories to the Leisure Village residents that they had interviewed and reflected on the new friendships they have formed. Both Olivia Locke, 11, and JoLea Robinson, 10, interviewed Marjorie Bishop. “I wrote about when she was younger and going to school,” Locke said. “It was really fun to get to know her and I liked when she told us about how she always walked to school,” Robinson said. For Bishop, visiting with both girls allowed her to share many stories from her youth and reconnect with her former role as a teacher. “I’ve formed many friendships with students over the years and now I have two new friends that I like a lot,” Bishop said. Tyler Dear, 10, interviewed Maxine Smith, a lifelong Presque Isle resident, and enjoyed hearing stories from Smith’s childhood. “My favorite story was one she told about a game she played. Kids would throw a ball over the roof and try to catch it,” Dear said. Tyler Dear, 10, reads the story that he wrote about Leisure Village resident Maxine Smith to her husband Vaughn Smith during the book release party for “A Gift From the Future to the Leisure Village Writers” on Sunday, Jan. 21, at Leisure Village in Presque Isle. “These kids are so polite and they seem very interested in older people. They seemed to like what I told them and it has been a wonderful experience,” Smith said. She was also interviewed by student Carlee Wood. Wright published the book in November 2017 through CreateSpace, a self-publishing website owned by Amazon. She said that the entire process taught her students how to conduct interviews, become more confident in their writing skills and form stronger connections with older generations. Copies of “A Gift From the Future to the Leisure Village Writers” and the original book “A Gift to the Future from the Leisure Village Writers” can be purchased at Merchants on the Corner in Presque Isle and on www.amazon.com.